Pre heat oven to 180°C or 350°F fan forced. In a dry mixer bowl, add 130 g or 4.6 oz of the almonds and mill for 9 sec/speed 9/MC on or until finely milled. Set aside. Add remaining almonds and mill for 9 sec/speed 9/MC on or until finely milled. Set aside with the other almond meal. Without washing the bowl, add the dates and chop for 10 sec/speed 5/MC on. Add 150 g or 5.3 oz water and cook for 5 min/100°C or 212°F/speed 1/MC on. Add bicarb soda and mix for 5 sec/speed 3/MC on. Let it sit while you lightly grease either a 12 portion muffin tray or standard cake tin. Add ingredients to date mixture in this order: almond meal. olive oil, eggs, vanilla, baking powder and salt and mix for 10 sec/speed 5/MC on. Spoon mixture evenly in to prepared dish and bake for 25 mins or until golden brown and a tooth pick comes out clean. This may take longer if you are baking it in a cake tin. 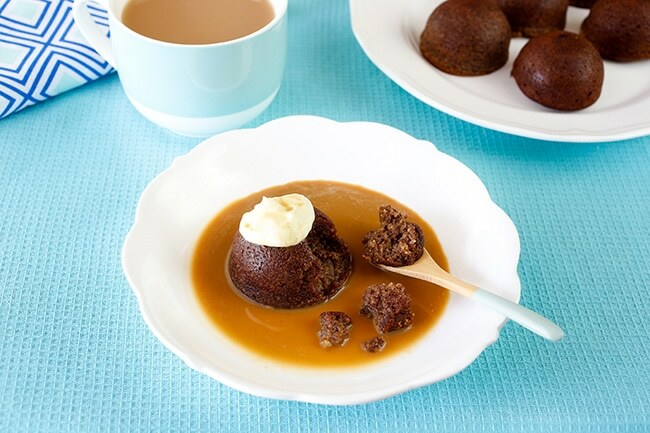 When the puddings are cooked, remove them from the oven and in a clean mixer bowl, add caramel sauce ingredients and cook for 8 min/70°C or 160°F/speed 4/MC on. 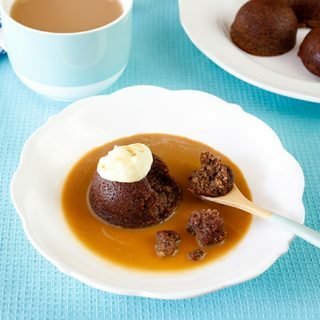 Serve puddings warm with caramel sauce poured over. You can use normal dried dates in this recipe by soaking them in boiling water first and draining the water off prior to using. You can replace the nuts with the same amount of Spelt flour or plain flour plus an additional 1/2 tsp Baking Powder. If using butter in place of the oil, how much butter? Made it twice, impressed my guests and my hard to please husband who isn’t a dessert person. He said it was the best sticky date he’d ever eaten! Thanks Mik! So good! Thankyou for another amazing recipe!! Fantabulous ! I made these exactly as per the recipe – delicious. Made ahead of time , the cakes and the sauce, and reheated just before serving. Can I use a replacement for the oil? If so any suggestions? Tia this sounds delish! Wow, what an amazing recipe! I was a little reluctant to try it because it wasn’t the “normal” go to sticky date recipe but nonetheless, having every bit of confidence in Nik’s recipe creation, I gave it a go. WOW. Delicious, flavoursome and I looked like a champion to my guests I served it to!! Thanks again Nik for all of your hard work in creating such beauties for us to look so good!!! Holy Moly this is my all time favourite Skinnymixer recipe. This is the first time I have been able to recreate a family favourite into something grain free that is as good as the original. I made the sauce with cream, xylitol and a tsp of molasses. It made 12 cupcake sized cakes. I was able to freeze these down but did make extra sauce each time as I like a lot of sauce! How long did you cook for muffin size? Yummmmm! The perfect winter dessert. To cater for allergies, I used egg replacer in the pudding. I used an electric beater to whip them until fluffy before adding to the batter. Coconut cream for the caramel sauce too, and it was a delicious dairy and egg-free dessert! If you haven’t made this yet…..do it NOW! Absolutely amazing. I can’t go back to making it the traditional way now. Perfect sweetness for me. And even quicker than the old way! This is delicious. I made as one cake. I’m the only one in the house who eats Sticky Date so after enjoying a piece a day for a couple of days, I portioned the rest and froze. So as not to waste the sauce I also froze but in IceCube trays. Now I just defrost the cake and heat, and have a couple of tasty caramel frozen cubes with it. Sooo delicious. Nik you are a genius! This is seriously the yummiest and easiest desert I’ve made in ages! Served it up to dinner guests and they thought I was an amazing cook…lol! I substituted the coconut sugar with brown sugar and was happy with the result. Thank you for your generosity in sharing so many of your recipes. What’s the Carb count on these? I worked these out to be: Calories:261 Fat: 19 Carbs: 17 Protein: 6. This is only for the puddings, not the sauce. This is for the brands that I used, if each muffin is one serving. Any suggestions on what brand of olive oil has a ‘light’ taste? I used ‘Moro traditional olive oil’ as that’s all I had in the cupboard, and mine were perfect! The Cobram brand and others are labeled, I think,Cobram light green bottle says Light. YUMMY!! Used 50 g coconut sugar and that was sufficient for us, still created a sweet caramel sauce. Thanks for great, quick & easy dessert Nik. Absolutely delicious!! Sticky date pudding is my hubby’s favourite dessert and he loved it and didn’t even realise there was no flour, etc. thanks Nic!! Halved the recipe for my family of 4 (with 2 eggs) and reduced thermo times by 1 minute. Took 30 mins in a small casserole dish. Wow, amazing!! First time I have enjoyed sticky date pudding in a long time. I made these at the weekend for guests, they needed to be GFand DF, very easy, quick and delicious, I used macadamia oil as I didn’t have olive oil. Thanks for such an amazing recipe. This was delicious, made it for my family Saturday night and they all loved it, thanks Nik!!! How to you make the caramel sauce recipe please. Heaven in bowl. Another perfectly delicious recipe that works exactly as it’s written. You’re recipes make us all look like amazing cookes. How did you make the caramel sauce? Would love to see a nutritional panel on this, and your recipes Nic. Do you think Avocado Oil would work instead of light olive oil? (Only because I don’t have any in the cupboard right now but I have avocado oil which is flavourless I believe). Thanks. Depends on your avocado oil. Some are horrid the Costco is good. Can these be frozen and then reheated? Hi I want to use my Varoma more. Do you think these could be cooked in the Varoma instead of the oven? Others in the group have. Follow steps as per the banana pudding in a little taste of Asia. hi do you reckon I could use walnuts or cashews instead of almonds, my son is new to dairy free and gluten free but also has sensitiveness to almonds. Oh my, this dessert is AMAZING. I cooked the puddings a few hours in advance and warmed them up for 30 seconds in the microwave and they were perfect. I put a dollop of whipped cream on top which made them even more yum. I could drink the sauce, it is so good. I cooked mine in a Bellini rather than a TMX, and the only change I made was cooking the sauce for an extra few minutes to get it to thicken. Could I substitute banana for the dates to make it suitable for Fructose Mal? How can u make lchf compliant? Dates aren’t lchf. This is not a pudding for this woe. The FOMO was real so I made a batch LATE at night. So not to wake the kids with grinding nuts I subbed spelt flour. Added a couple teaspoons of baking powder, mixed slightly less and baked for 12 mins. They are delicious! I’d love too know too. Steamed in the Varoma would be great! People in the group have steamed. Use the method as the banana puddings in ALTOA book. Yes you could use normal sugar. Brown sugar would give it a more caramel flavour than. Kemal sugar if you had that. How many calories per serve? My favourite dessert ever! Thanks Nik! Can’t wait to try this one!! Can I substitute the almonds with my left over almond pulp(meal) from my almond milk? How many servings is this ? Recipe says 12 portion muffin tray and I’d assume 1 is a serve? Can We use normal pitted dates? And if so do we use the same quantity? I think a flax or chia egg would work in this!